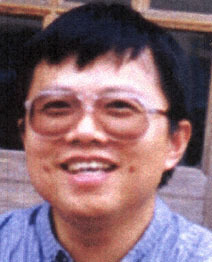 Hweidar Jian moved to the United States from Taiwan to continue his education. It was an importance he emphasized to his American-born sons. "He wanted to stay in the U.S. to give us a chance at a better education," said his oldest son, Haomin Jian, 19, an economics and finance student at the University of Maryland. Born and raised in Taiwan, Hweidar "Dar" Jian, 42, was a brilliant software designer who was fluent in three languages; English, Chinese and Taiwanese. While serving in the island's mandatory military service, he learned to design computer programs. When he came to the U.S., he enrolled in graduate computer studies at SUNY in Buffalo, his son said. There, he met his wife, Juhsiu, also a Taiwan native, who is a computer-firm executive. The couple has three sons; Haomin, William, 12, and Kevin, 8. Last year, Jian started a new job as a senior programmer analyst at Cantor Fitzgerald in the World Trade Center. At Cantor, he designed software programs to traders' specifications. It could be frustrating: He complained sometimes that the traders didn't know what they wanted. Jian won over colleagues with his easy-going style, lively sense of humor and a ready willingness to help others. "He was kind of difficult to upset," his son said. "He was pretty laid back." Jian didn't like to bring work home. He worked hard during the week, leaving home in East Brunswick, N.J., at 6:30 a.m. to catch the bus to Manhattan. He'd return home at 7:30 or 8 p.m., as his younger boys were getting ready for bed. "He spent as much time with us as he possibly could," Haomin said. "A lot of the time, he was pushing himself very hard." On weekends, he'd catch up on his sleep and take his sons to tae kwon do classes or piano lessons. Coming from the densely populated Taiwan, Jian enjoyed living in the suburbs and having a house with a backyard. Gardening was relaxing for him, as well as his knack for tinkering with stereo systems, DVDs and all kinds of electronics equipment. Soon after Sept. 11, Jian's sons returned to school, their homework routines unchanged. "My mother kept the family on routine," Haomin said. "She was back at work two days after it happened. She was really strong through the whole thing." To honor the other 2,995 people killed that day, please go here.